The British Berkefeld SS2 Outdoor Water Filter purifies untreated water from rivers, lakes and ponds into safe pure drinking water. This drinking water filter is gravity fed, and does not require a pressurized water supply, nor electricity to operate. It runs completely off grid. British Berkefeld gravity filters are recommended for field operations by many of the worlds major aid and emergency relief organisations, such as the Red Cross and Médecins Sans Frontières (MSF). 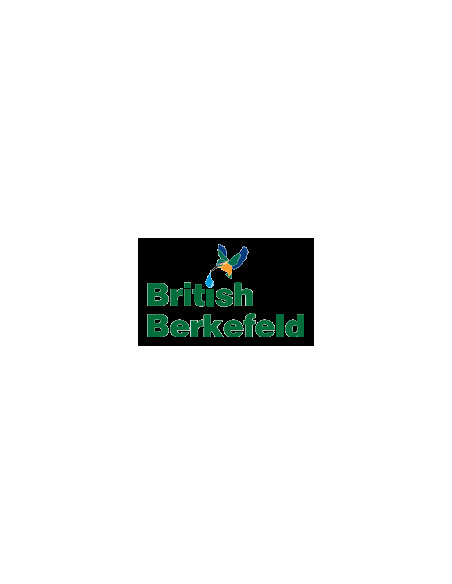 The British Berkefeld SS2 water filter uses ceramic filter candles to remove chlorine, bacteria and chemicals from your drinking water. Each filter candle has a maximum capacity of 2000 liters and a lifespan of 6 months. The structure of the ceramic filter candle is designed to be cleanable. Regular cleaning will allow its filtration efficiency to become regenerated many times before it needs to be replaced. New, unused candles can be stored for an unlimited time. British Berkefeld gravity filter performance. The British Berkefeld gravity filter is powerful, economical and perfect for use both at home and outdoors. The filter housing consists of two seperate chambers. The upper chamber is filled with contaminated water. The ceramic filter candles connect the upper and lower chamber. Gravity makes the water seep slowly through the filter candles. In the lower chamber, safe clean drinkingwater is collected. You can use up to 4 filter candles at the same time, more candles increase the filtration rate up to 80 litres per day. The British Berkefeld gravity filter was first developed in Great Britain, over 150 years ago. Ever since, the filter has been gradually perfected. Today, the Britsh Berkefeld gravity filter still produces the worlds freshest, best tasting drinking water. For maximum corrosion resistance, the British Berkefeld gravity filter is manufactured in high grade polished Stainless Steel. It is hygienic, durable and easy to clean. The filter candles are produced under the BS EN ISO 9002: 1994 quality standards. The candles are also certified by NSF, NAD and WRAS, which proves that they comply with the heighest standards for drinking water filters. The British Berkefeld SS2 gravity filter comes with 2 Super Sterasyl filter elements. If you wish to also remove heavy metals from your drinking water, please choose the ATC Super Sterasyl filter candles above. There, you can also select additonal filter candles at a discounted price.